The North Cornwall Railway (The Withered Arm) | Launceston Then! 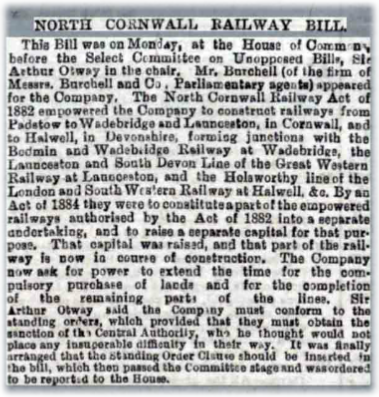 agreed to the arrangements for working the North Cornwall Railway line and an Act was duly obtained on 18th August of that year permitting the North Cornwall Railway line. The first North Cornwall Railway Company board meeting was held on the 17th of October 1882 at the Town Arms Hotel, Bodmin. Chairman was Mr. John Tremayne Esq. of Helegan, St. Austell, and the board of directors were The Earl of Wharncliffe, Viscount Torrington, Charles Gynn Prideaux-Brune, Lewis Charles Foster, Charles Gurney, T. Martin, Sir W. W. Onslow, C. Bainbridge Rendle, Captain W. Teague, and J. Oag. At this meeting Messrs W. R. Galbraith and R. T. Church were confirmed as consulting engineers and J. Drew of Exeter as the surveyor. Due to the total length of the line it was realised that it would need to be financed as each section was laid, so a separate Act was obtained in 1884 called the Launceston& Halwill Section Act. There was little trouble in raising the finance for the first section and by 1885 the share issue was fully taken up, with some notable locals buying into the company such as Mr. J. C. Williams (Werrington Park), Sir Harding Gifford (M.P. For Launceston) and the Duke of Bedford. 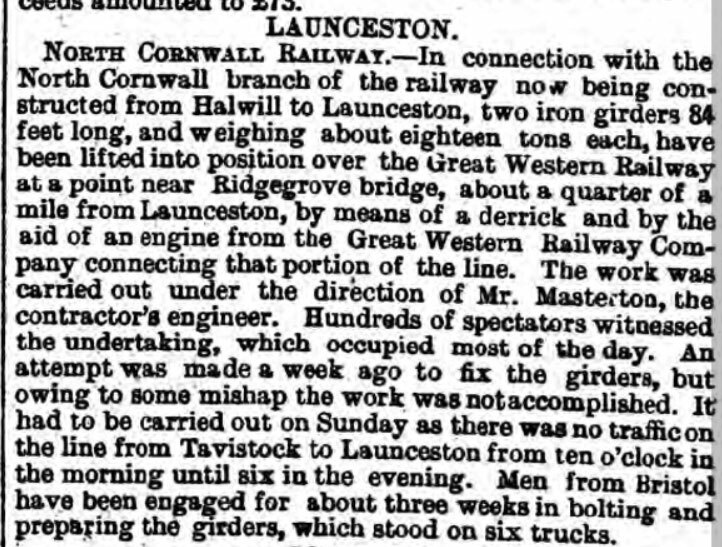 The contractors were Curry and Reeve & Co.
With that the work started on the line at Halwill on the 30th of June 1884 with a ceremony attended by many local dignitaries in attendance including the Mayor of Launceston and the NCR board. The chairman, Mr. Tremayne cut the first sod and Mr. W. Harris of Winsford, Halwill (who had given the land) taking the second cut to much applause. Steady progress was made, although due to the amount of Navvies there was a distinct lack of accommodation available at the beginning but this was eventually remedied by the contractors. Heavy snow in January and heavy rain in February curtailed the work for several days. This wasn’t helped when there was an outbreak of small pox amongst the Navvies thought to have spread from Cardiff, in April 1885, and it the men had to be separated. Huts were erected near Halwill and the infected men were treated. 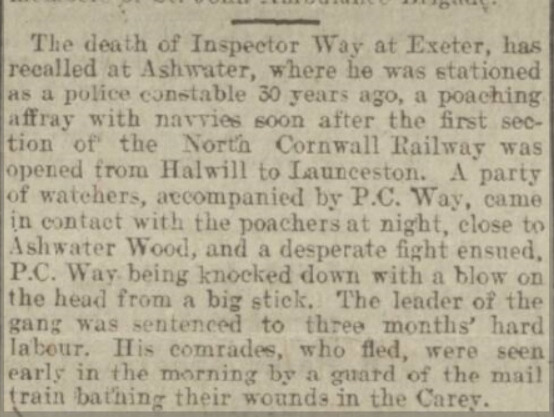 The Navvies were somewhat of a problem throughout the work, with poaching, drunkenly behaviour and criminal actions including seven men attacking the landlord of the Railway Inn when he was out for a ride on his horse. 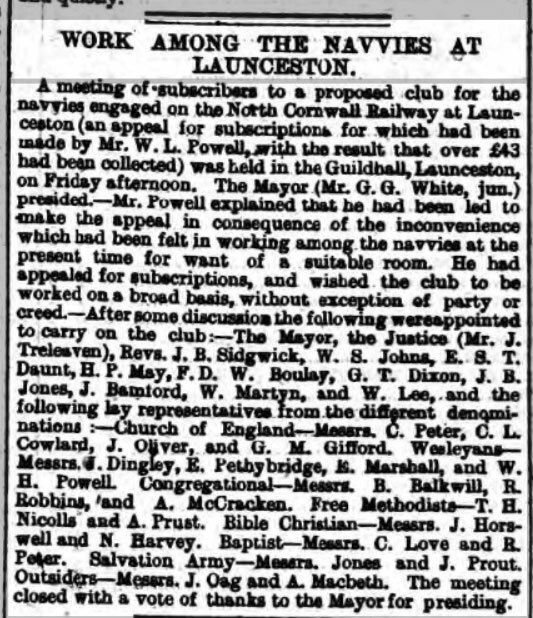 However, this did not stop the Launceston residents in trying to help the lot of the Navvies by organising a Navvy Mission for their entertainment and idea brought forward from a meeting held in June of 1885 and chaired by the Mayor, Mr. G. G. White at the Guildhall. 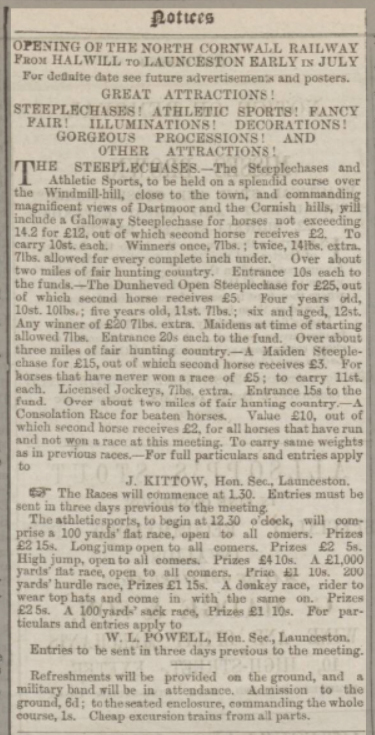 By June of 1885 4 miles of track had been laid and the girder bridge over the GWR line had been installed before an audience of several hundred spectators. There were over 9 miles of line by February 1886 and by March Ashwater Station and House were complete. 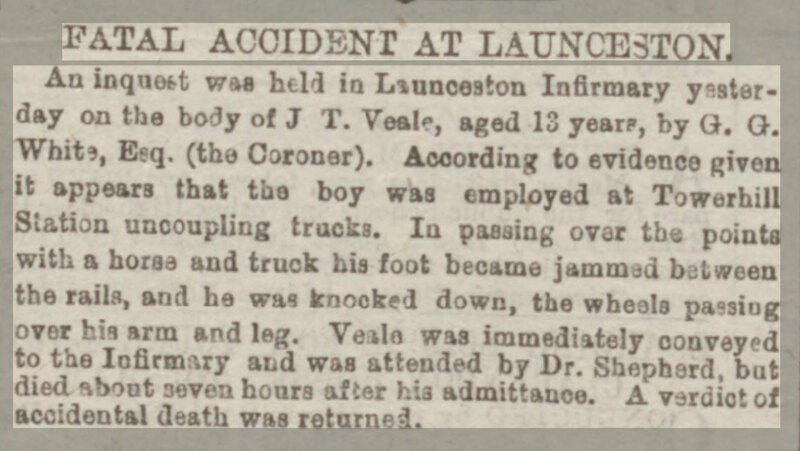 In May of 1886 with the workers now working past Tower Hill there was a fatal accident with the death of a 13 year old boy, John Thomas who died of his injuries sustained when he caught his foot between some rails and fell with the wheels of a wagon passing over him. The line was completed by July 1886 and the grand opening was held on Tuesday the 20th of July with the line opening for public traffic the following day to much jubilation in the town as the narrow gauge system had finally arrived. The engine steams right down to Linden fells’. A special train adorned with greenery (seen below after its arrival at Launceston) left Queen street Station at Exeter at 8:45 am and among the privileged passengers were Mr. Arthur Mills (Director of the Company), Mr. Scotter (General Manager of the L&SW Railway company), Mr. Gardiner (Superintendent of District Railways, London), Mr. S. T. White (Divisional Superintendent, Exeter), Mr. B. J Fisher (Engineer, Exeter), and Mr. J. Medway (Locomotive Superintendent, Exeter). Adams 445 class 4-4-0 No. 448 at the opening of Launceston Railway Station. Exeter was represented by the Mayor of Exeter, Mr. R R. M. Daw, Mr. Alderman H.D. Thomas and Captain Courtenay Edmonds. At Okehampton their Mayor, Mr. C. Green joined the party. Large crowds cheered as the train pulled into Ashwater and Tower Hill stations respectively. 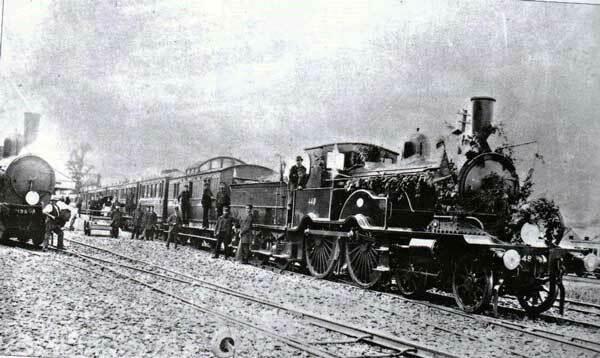 The trains arrival at 11:00 am in Launceston was signalised by the firing of detonators and the waving of flags. All the local dignitaries were assembled to greet the train including the Mayor, Dr. Andrew, the Town Clerk, Mr. C. H. Peter, Councillors Dr. Raiph Pethybridge, J. B. Geikie, T. P. Trood, Nicholls, W. Proctor, and Fraser. Addresses were then given by the local Clergy, the Mayor of Launceston and Mr. J. Tremayne, chairman of the North Cornwall Railway Company. A procession was then formed and marched through the town, headed by the Band of the Exeter Engineer Volunteers and Okehampton. The procession ended at the White Hart Hotel where a luncheon was layed on for all the officials and directors. The crowd was reported to be of several thousand, with inhabitants from towns far and near having come to Launceston to take part in the festivities arranged for the occasion. The festivities included a fancy fair at the Castle, followed by a public dance in the evening to the music of the Launceston Band. 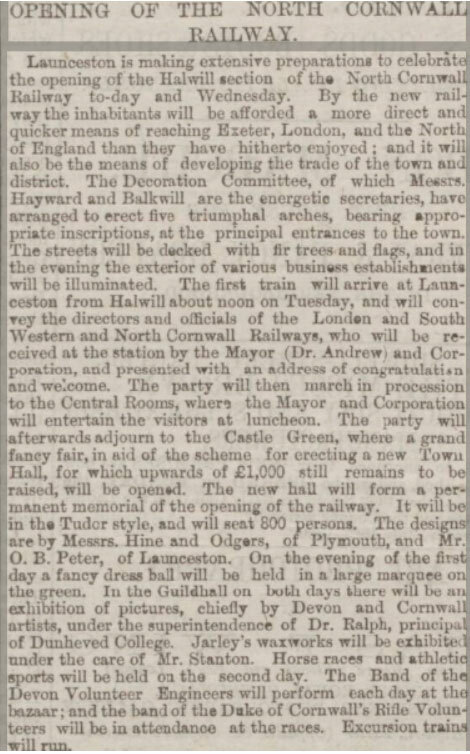 There was also an exhibition of wax works and pictures at the new Town Hall that had just been erected (the aim of this exhibition was to raise £100 towards its construction cost). Unlike the opening of the Launceston and South Devon Railway, the weather was beautiful and the days entertainment passed off successfully. The following day however the weather had turned with heavy rain setting in at ten o’clock and continued for the next five hours. This did nothing to stop the enthusiasm for the holiday spirit and the further entertainment at Scarne, Hurdon and Badash of a series of Steeplechases and athletic sports at Windmill . With an attendance of five thousand people the town was full to brimming, but with many coming from some distances and having to catch early trains back, the town was left to its own residents to enjoy the last of the entertainment. The North Cornwall Railway was up and running. The second section of the North Cornwall line was from Launceston via Egloskerry to Delabole and work started in November 1890 and eventually arrived at Tresmeer (Splatt) in July 1892. The reason for the 6 year delay was mainly due to the costs as the L&SWR realised that it would be difficult to raise the finances from local means. The delay also meant that the NCR’s powers which expired in 1895 would have to be extended so a new Act had to be applied for which was duly obtained in July 1891. Even though some work had begun in 1890 there were considerable delays due to the acquisition of land as many landowners were holding out for higher rates of compensation. Eventually the land was purchased, sometimes by compulsory purchase, then the January of 1891 was particularly wet and slowed work down, however, it was reported in February of 1891 that considerable progress had been made in the first eight miles. Land at Badharlick Bridge was given by Mr. Simcoe of Penheale Manor, Egloskerry for the station. By September 1891 there were two miles of permanent track layed down but due to the poor weather through the summer and the lack of labour progress was slow. With more men being drafted in that had increased to 5 miles by April 1892. There were casualties in the work including a Mr. G. Harvey who was killed from falling material whilst working on the Red Down cutting near the approaches to Egloskerry. The line to Tresmeer was finally finished and the official opening was held without much ceremony on the 28th of July 1892 to coincide with the Launceston Agricultural Society’s Show. 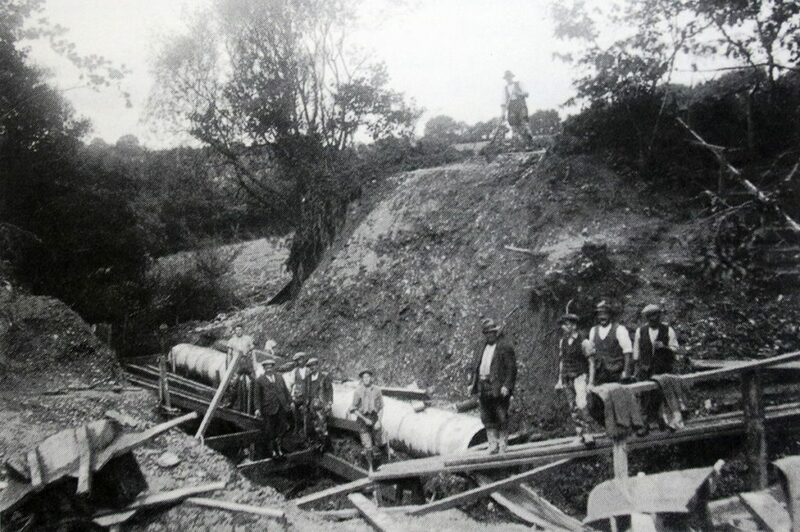 Navvies building the railway at Newmills in the Kensey Valley c.1891. 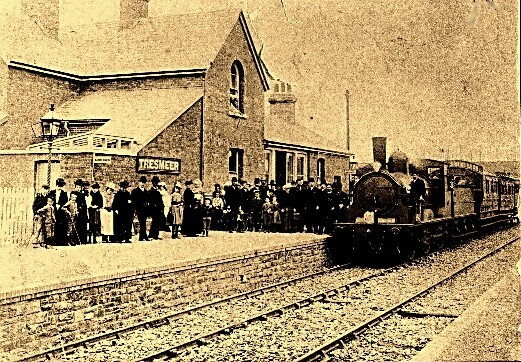 Opening of the line to Tresmeer in July 1892. Egloskerry Station was the only one between Halwill Junction and Wadebridge to have a railway crossing (left), which in the early days did cause problems especially in June 1893 when a Mr. Dawe was driving a pair of horses attached to a wagon over the level crossing. He being rather deaf, failed to notice the approach of a train. Both the horses were caught by the engine and killed. Mr. Dawe sustained injuries including a severe scalp wound. 34017 Ilfracombe Bullied Light Pacific crossing Egloskerry Railway Crossing. The line eventually made its way to Padstow opening for its entire length on the 23rd of March 1899 15 years after the first sod was cut and for the next 66 years the line proved a vital transport link for North Cornwall especially for Launceston which enjoyed renewed prosperity with new markets opening up. The towns population after years of decline started to rapidly increase and numerous houses were built around Newport and on the outskirts of Launceston. Many of the middle class houses we see now in the town were built at this time, particularly along Dutson Road, Tavistock Road and Dunheved Road.